Yummy. Processed oil made to look and taste like butter! Margarine has been marketed as a healthy alternative to butter. It contains less saturated fat than butter and is made from vegetable oil. So far so good, right? Not exactly. Instead of saturated fat, margarine contains trans-fat, which is worst for you than saturated fat. The reason margarine is soft at room temperature is because they hydrogenate the oil, making "made from vegetable oil" not as healthy as it sounds. Oils processed that way are clear, so it has to be colored to look like butter. 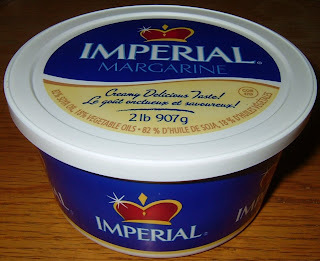 There is even a law in Quebec forbidding the coloring of margarine (it looks lighter than butter there). That's not to say butter less fattening than margarine, some margarine does indeed contain less fat than butter. Butter also contains cholesterol, as it is an animal product. For me, the decision is purely by principle; I would rather eat "natural" fat than synthetic fat. Margarine doesn't provide any greater benefit than butter, so why eat margarine? I only use margarine as a spread when I'm in a hurry (anyone can relate to the frustration of using cold butter as a spread). Cooking with margarine is out of the question; heating modified oils is not a good idea. The key to eating healthy is moderation; it doesn't matter whether you choose butter or margarine. I recently switched back to butter after using margarine primarily for a good while. I made the switch because I started to notice a "fake" taste to margarine. This was around the same time sugar, especially it's aftertaste, started to taste fake to me too. I guess with this they're about equally bad, so making a decision based on taste isn't a bad idea. Using new technologies, margarine manufacturers have met the challenge and eliminated or reduced trans fat in margarine products, making a good product even better. In fact, almost every soft margarine product now shows “0 grams trans fats” on its label. In addition to great taste and convenience, margarine contributes to lower blood cholesterol levels when substituted for butter and it contains vitamin E and essential fatty acids. When comparing margarine to butter, many margarine products are the recommended alternative as stated by of the American Heart Association, as well as the Federal government’s National Cholesterol Education Program. And yes, it’s still an economical choice for the consumer.